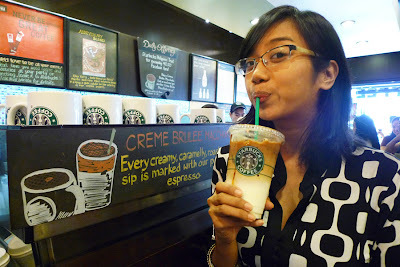 Crème Brûlée Macchiato is a warm mix of creme brulee flavored syrup, steamed milk, and Starbucks® espresso. It is then topped with foam and lined with roast dark caramel. My officemates and I went for some Starbucks today when we found out from Nomnomclub.com that Starbucks Philippines is giving away a second Creme Brulee Macchiato to everyone who buys…well…a first Crème Brûlée Macchiato. This promo is to celebrate Starbucks Philippines‘ 400,000++ fans. One of which is me. So it’s buy one, and get another cup free! You can get this regardless of what size or temperature Crème Brûlée Macchiato you order. Your second cup will be of equal or less value, and can alo be hot or cold (regardless of your first cup’s temperature). And you get it RIGHT THERE. So all seven of us went over to Starbucks Market! Market! to get eight drinks for the price of four. The other two were busy and had transferred their drinks into their personal tumblers. Ehehe. 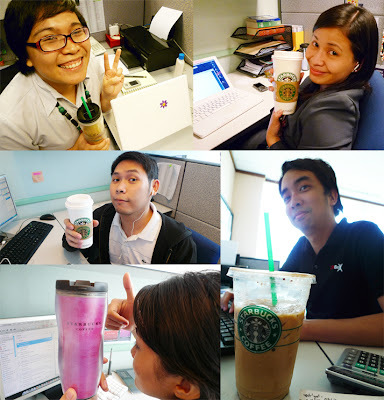 It said in Nomnomclub that all we had to do was say the key phrase, “I am a Starbucks Philippines Facebook Fan”. I was a bit skeptical at first—“Seriously? That’s it? There has got to be a catch.” But there is none! It really is that easy. Note: Crème Brulee Frappuccino Blended Coffee is NOT included in the offer. It was my first time to try the Crème Brûlée Macchiato, actually. My suggestion: the cup may look pretty, but stir your drink because your last sip is going to be bitter. But if you like bitter coffee and would like to enjoy a journey of flavor, sip it from the sweet milk to the strong coffee. I imagine that’d be fun, if only I was a black coffee person. This treat will only run from until TODAY, October 28, 2010, so go and visit your favorite Starbucks now! Thanks for the heads up, Nomnomclub! And congratulations, Starbucks Philippines!